has two rod holders 3 compartments dry hatches and a nice console for mounting additional rod holder bracket stlye or gps etc. well used and cared for. it has typical scratches etc from years of use, its been there done that paddled from appollo beach to st pete and back one day caught all kinds of fish that trip. Its been awhile since i used it. Its a sit on top dry hatches foot pegs etc. i know the handles and bungee webbing needs to be replaced as well as a new seat or rewrap the exsisting one i put my life jacket on it. It is great shape otherwise , many many miles on it i was a paddling fanatic. Only selling as i need some outboard parts for my family boat. Will consider trades or same value or ideally cash plus partial trade. Things for boating are preffered garmin marine gps etc. also need the typical boating goods plow anchor bumpers trolling motor batteries etc. will also trade for a running mercury 115 hp or better ideally a mercury 1150 115hp as thats what i have on there now and would love a second one. Also need parts for that motor they are getting hard to find. Need a nice galvanized or aluminum trailer for a 17+ foot boat. Ofcourse a cash offer will take it first as I need parts and those cost cash. This is roughly half what i paid for it, not a cheap kayak , its fairly light easy to launch carry. Has some scratches etc from all the miles and island landings overall good shape for the age and use has dual rod holders 3 compartment hatches. My buddy has a gps mounted on the cc of his these are easy to customize and have all kinds of options. check out the huge trout and snook i caught with it. 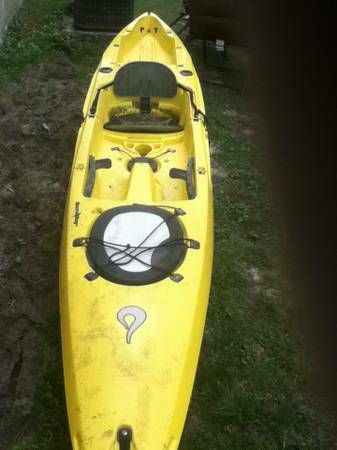 Will consider trades of similar value reduced price to 700 for quick sale includes paddle.